This article provides several fun and effective, research-based strategies for teaching sight words to children. The strategies in this article are based on the Orton-Gillingham approach which promotes the use of multi-sensory instruction. Multi-sensory instruction allows children to learn using multiple senses (e.g, hearing, seeing, touching). This is important because not all children learn one way, or thrive from the same type of learning. 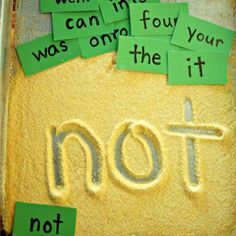 Sight words are commonly used words in literature that young children are encouraged to remember and recognize just by looking at them, without sounding them out. Once a child learns all the sight words on Fry’s sight word lists, she can read 75 percent of the printed words in children’s literature. This article gives fun ways to teach these sight words using research based strategies. Keep in mind, many children have the most success learning sight words when taught in a small group or practicing one-on-one with an adult or another child with established skills. 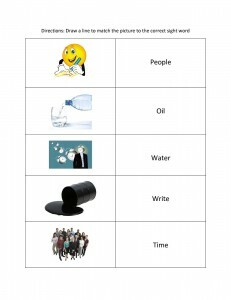 Reading and writing sight words multiple times and connecting sight words to visual images, helps in grain them into a child’s memory. Reading, writing, or saying the same words over and over can be boring for a child. Here are some ways to make learning sight words fun. 1. 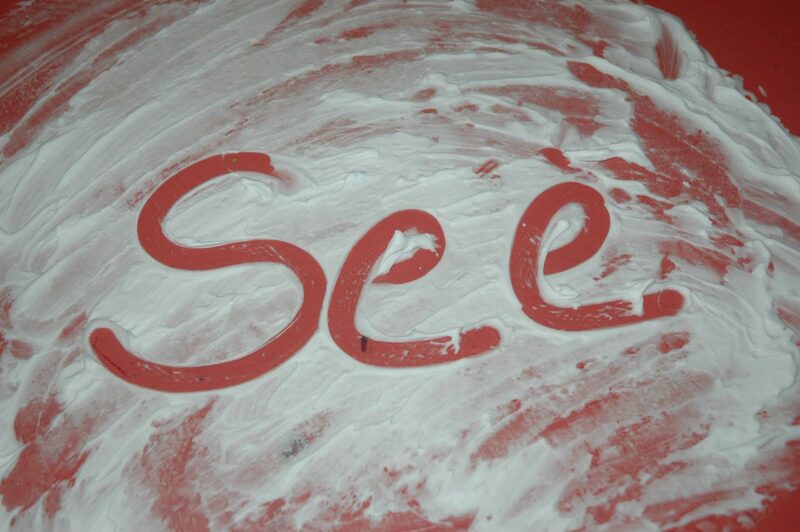 Have your child recreate the word in fun and imaginative ways. 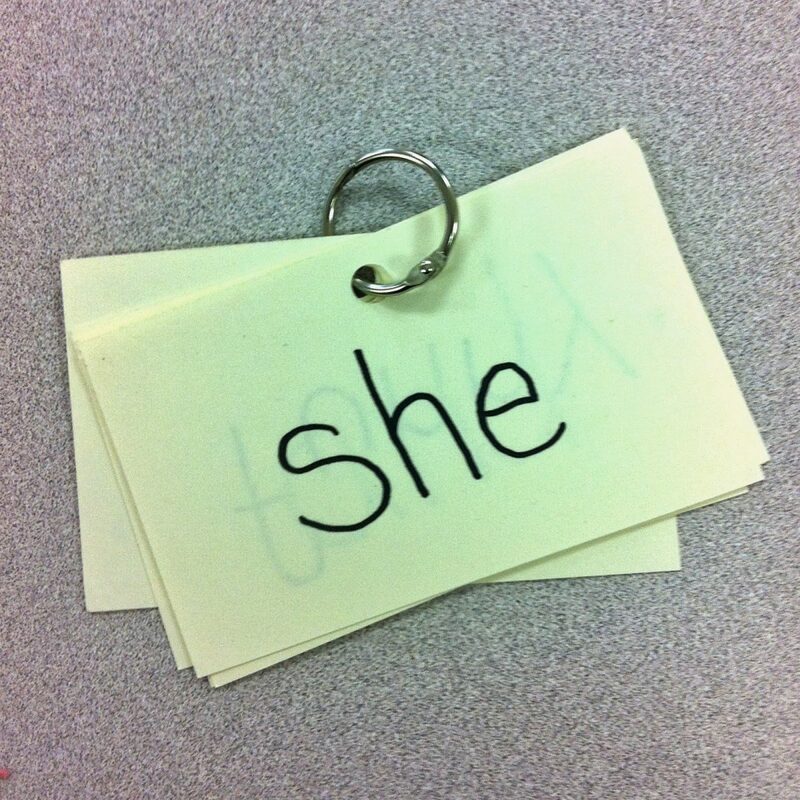 1-First, show your child the word on a flash card like the ones shown below. 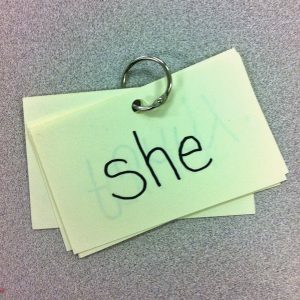 2-Have her recreate the word, using a method of her choice, where she can erase the word and write it/make it over as many times as she likes. Suggest that she does each word six times per practice round (three times while looking and three times without looking). Provide assistance as needed and let her look back at the flash card when necessary. writing it in sand (with finger or back of pen) in a sand tray (you can use a shallow baking pan for a sand tray). If your child cannot write yet (or for more fun alternatives for a child who can write), you can have her spell the words using magnetic letters! 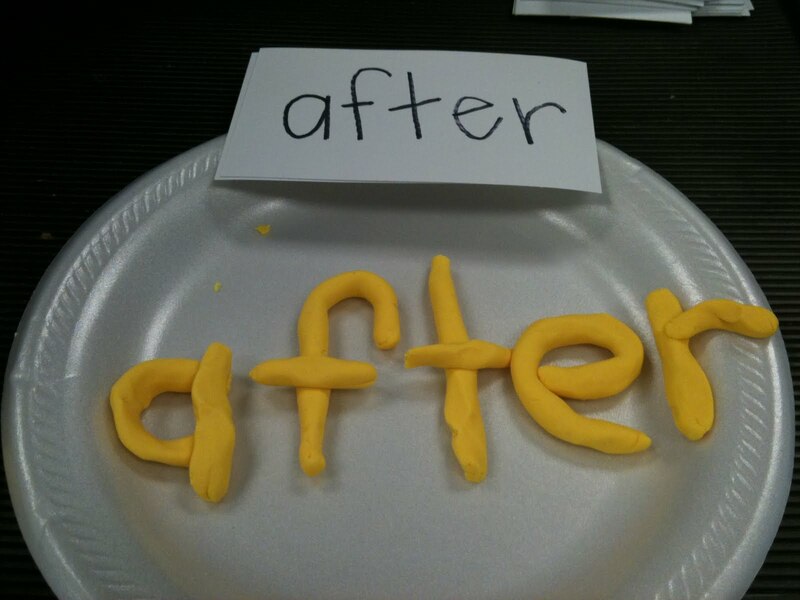 or create the words using Play-Doh, providing assistance as needed. After your child gets the hang of spelling the word, take away a letter and have her fill in the missing letter (e.g., a _ t e r). As she improves, take away two or three letters and have her fill in the missing letters (e.g., a _ t _ r). When using play-doh or magnetic letters your can mix the letters up and have her put them in order (of course providing assistance as needed and showing the flash card again if necessary) (e.g., a t f r e). Have your child look at and say the word each time she creates it. Use the word in a sentence to help your child connect real meaning to the word (e.g., I like to watch TV after dinner). The methods here are only suggestions, feel free to come up with additional methods to implement the strategy of recreating words. Where can you get sight word flash cards? You can purchase them on a site like Amazon . You can create your own flash cards at home (or in the classroom) using index cards, and ask your child or students to help make them, if possible. You can also print out free flash cards on the internet, such as the ones at student handouts.com. To take flash cards on the go for fun games and practice at a place like your child’s friend’s house or the park, punch a hole in them and put them on a ring as shown below. If you make flash cards on index cards or print them out from a site like student handouts.com (and decide to take them on the go) you may want to laminate them to avoid them getting crumpled or ripped. Purchasing your own laminator and laminating patches, such a the Scotch Thermal Laminator Combo Pack shown below. If you work in a school, they may already have a laminator for you to use. If you are a parent, you can also try asking your child’s school if they can help you laminate some flash cards. 2. 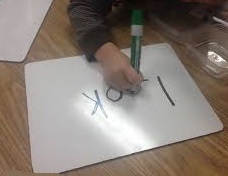 Connect the sight words to a visual image. She can do the same thing in sand or shaving cream. She can also make the picture out of play-doh or draw it on paper. 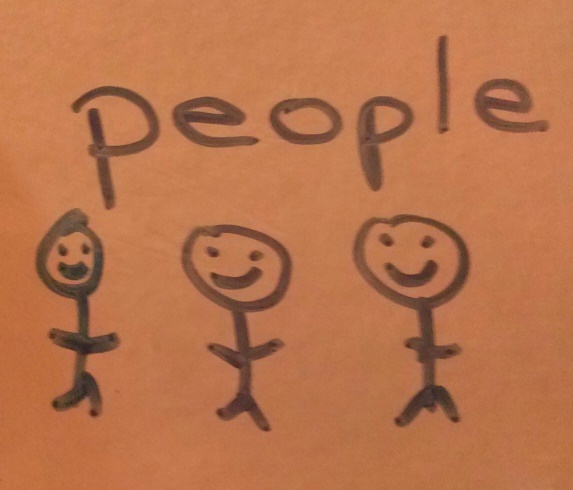 Draw pictures or put images on one half of a sheet of paper and write sight words on the other half. Have your child match the words to the drawings (you can also pick pictures by doing a search on Google Images and inserting the pictures into a table on Microsoft Word). If you like you can print the sample worksheet above for your use. Make a sight-word bulletin board. You can do this as a project together. Here is an example, If you are working on five words this week (e.g., water, people, oil, write, and time), put the words on the board with a picture by each one (you or your child can draw the pictures, you can get them from Google Images, cut them out from magazines, etc.). Refer to the board throughout the week. For example, you can ask your child to find different words randomly. Also, when you are in conversation you can point to words or ask your child to find words when you hear yourself using them. 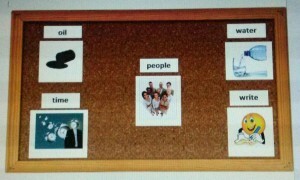 Here is an example of a sight word bulletin board. Put the words you are practicing to a favorite tune and sing it over and over. For example, try singing a-b-o-u-t to the tune of Mary Had a Little Lamb or h-a-v-e to the tune of Happy Birthday. Remember the Aretha Franklin song R-E-S-P-E-C-T? I know as a kid that song helped me remember how to spell respect. Try creating your own tunes with your child and sing your songs whenever you want to practice. 4. Frequently read children’s books with your child about topics he/she is interested in. Depending on her level, you can read while she follows along, she can read to you while you follow along, you can take turns reading to each other, or you can ask her to point to or read certain words as you go along. Children’s books have many sight words from Fry’s sight word lists, so frequent reading will allow your child to see words over and over, helping her lock them into her memory. Sight Word Bingo – This game is just like regular bingo. When you call out the word, the child puts a chip on his bingo card if he has that word on his card. 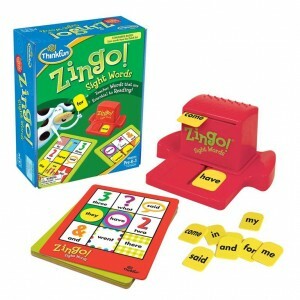 You can create the cards on your own or purchase a game like Zingo Sight Words (ready-made sight word Bingo). See a picture below. 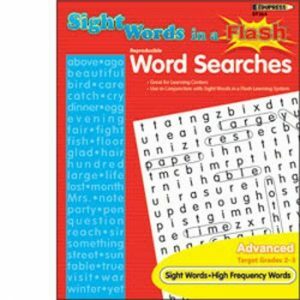 Word Searches – Many word searches containing sight words are available for printing on the internet, such as the ones at K12 Reader. You can also purchase word search books . See an example of a word search book below. Splat! (grades k – 1 and grades 1 – 2) is another fun game that you can purchase or make your own version at home. 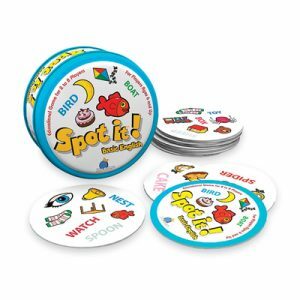 Splat comes with 75 sight words and can be bought for readers on grade level k-1 or 1-2. Players lay cards out in front of them. As the caller reads each sight word aloud, players look at their cards. If a player has a matching word, he or she says “SPLAT!” and flips the card over. The first player to flip over all of his cards wins. You can easily make your own version on index cards. See a picture of Splat! below. Spot It! – This game allows players to match pictures to words, pictures to pictures, and words to words, by spotting the match between cards. It reinforces sight word recognition, reading comprehension, and builds English vocabulary. See a picture below. Side-Note *If you are a teacher you can try all the strategies and games above with your students. Also, older siblings or peers with strong sight word recognition can also work with children who need to practice their sight words. Many children love the job of teaching other kids and would also have fun playing games like the ones in this article. If you do choose another child to work with your child or student, monitor the interaction to ensure the other child is being kind and not getting frustrated with the child he/she is helping. Change the peer helper if necessary. Keep in mind that every child is different. Some respond to several strategies, others respond to a few, while others may not respond to any of the strategies you try. If your child is significantly struggling with recognizing sight words or acquiring other academic skills, despite consistent practice and guidance, talk to your child’s school and/or doctor. They should be able to refer you to the appropriate professionals to determine what might be interfering with your child’s progress and what additional strategies might help. Remember to always stay calm when working with a child or student, even if you think they should be getting something that they are not getting. If you get frustrated with them, they may start to feel anxious, angry, inferior, stupid, etc. which will lead to a less productive learning session. Keep sessions short (5 to 10 minutes for younger children or children who get easily frustrated and 10 to 15 minutes for older children or children who can work for longer periods without frustration), unless the child is eager to keep going. For suggestions on how to encourage students to complete tasks/assignments that they may be resistant to see How to Use Schedules to Improve Children’s Behavior and 3 Ways to Use Timers to Encourage Homework and Chore Completion.